The Trionic Group’s vehicle management system, the GP400 will be utilized on all Xtreme XR1055s Telehandlers. The Trionic Group presented their full line of products at the 2017 APEX International Access Platform Exhibition on May 2-4. Most importantly, Trionic Group introduced its new division located in China, Trionic Shenzhen. It was another successful show giving us the opportunity to showcase all of our capabilities to our existing and potential customers worldwide. 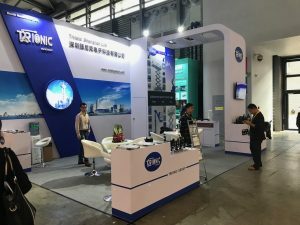 The Trionic Group presented their full line of products at the 2014 International Access Platform Exhibition on June 24-26. “APEX was a great opportunity to connect with new faces and reconnect with old friends”, said Trionic Group President Christian Peyla. In response to customer demand, the Trionic Group, has just introduced its new CAN-based Display Module. It’s equipped with a 3 digit display to easily show battery charge status and fault codes to the operator. With its compact design it provides 3 momentary switches for user specific functions and 3 indicator LEDs, as well as several inputs and outputs for additional switches, sensors, lights, buzzers and joystick connectivity. Access International has published an article written by Trionic Group CEO Christian Peyla discussing the benefits of DC motor technology when used in conjunction with the Trionic SEM600 Dual Motor Controller. 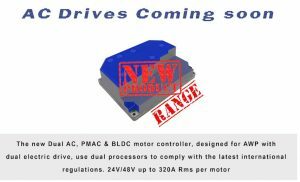 The Trionic Group is pleased to announce the release of its innovative SEM600 Dual Motor Controller. Patented technology eliminates the need for speed, position, and steering sensors by implementing an automatic differential lock that senses when a wheel loses traction and directs torque to the other wheel. This allows for significant reduction of cost and complexity when combined with separately excited motors. Also new is the TS100 controller, a low-cost, self-contained controller designed specifically for the needs of low level access with permanent magnet motors and caster wheels. PG Trionic, Inc., Essex, MA received patent 7,956,558 from the US Patent office on June 7, 2011, for its automatic traction control system. The automatic traction control system may be used with vehicles using two separately excited motors where the armatures of the motors are connnected in series to provide differential control.